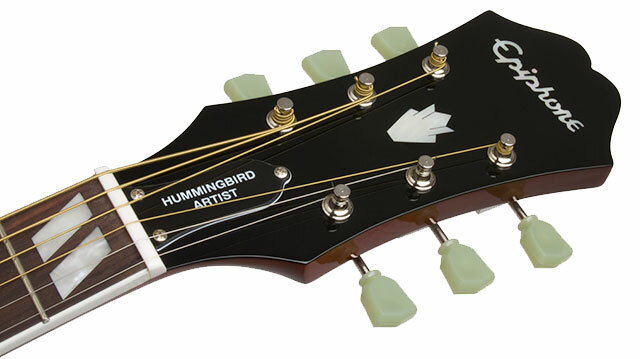 The Hummingbird is one of the most famous acoustic guitar designs and its preference as the go-to acoustic for rockers like The Rolling Stones’ Keith Richards, pioneer country rocker Gram Parsons, and multi-platinum artist Sheryl Crow is proof that the Hummingbird is a must-have for its warm but pronounced tone which perfect compliments voices that have a story to tell. Now with the Limited Edition Epiphone Hummingbird Artist you can get that iconic sound in a no-frills all-tone package. The Hummingbird style acoustic has appeared on some of the most famous albums in rock history including Exile On Main Street and the Hummingbird Artist carries on that tradition with a stripped-down, just-the-basics look that still retains all of the Hummingbird’s vital tone and construction features. After all, it’s all about tone and the Hummingbird Artist has got it. The Hummingbird Artist has three distinct and beautiful color finishes including Faded Cherry (FC), and Vintage Sunburst (VS). And as with all Epiphone instruments, this bird will keep singing with a Limited Lifetime Warranty backed by Gibson’s famous 24/7/365 customer service. Reach out to your Authorized Epiphone Dealer today and make history with the Hummingbird Artist. The Hummingbird Artist features a select mahogany body and top for a warm but balanced tone that sounds great played solo or riding on the top of a mix with a stinging electric guitar. 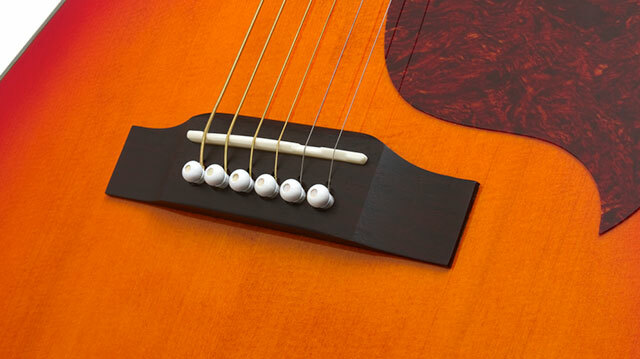 The easy fitting hand-set 25.5” mahogany neck has eye-catching Split Diamond pearloid inlays. That iconic inlay pattern was a break from tradition in the '60s and is still one of the Hummingbird’s many visual trademarks. The strings pass through a bridge with a synthetic bone saddle and the soundhole is framed with a tortoise shell style pickguard cut to the classic Hummingbird style. The 1.68 nut-width is ideal for the classic Hummingbird body shape and SlimTaper™ neck and holds steady for hard rhythm styles as well as fingerpicking. This Hummingbird sings with premium die-cast machine heads with classic vintage style “tulip” shaped tuners and an Epiphone Sloped Dovewing headstock complete the look.